So you thought The Bats were a 100% South African? Well you ain’t seen nothin’ yet, baby, or rather……..“Take a sho’t left China, the toppies are now full on, proudly and clearly loudly……South African.” And let me tell you, it’s THAT OLD BAT MAGIC that will take you on a taxi ride from the Cape to the Townships, from the 60’s to now now, with no stops, just laughs and hair raising bends. Okay not so much of the hair and limited bends, but it’s a ride you wont forget. And all four wheels are intact; Eddie Eckstein, Paul Ditchfield, Pete Clifford and Derek Gordon are all still roadworthy, in a manner of speaking. 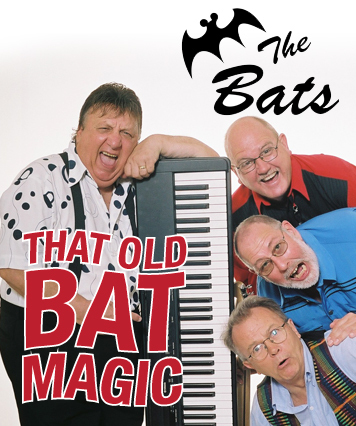 Being one of South Africa’s longest running products, with unlimited mileage, The Bats are back Rocking and Laughing the night away with their brand of memorable music and side splitting humour. So if you want to forget your troubles like ZUMA, JULIUS AND THE GUPTAS, pop in and let them relax you. Ja these four vintage classics bring to you the murst amazing shurw that is cool, kiff, and just plain lekker…..seriaas! Rock up. They’re legend!